I'm doing something a little different this week. First off, I'm posting a game report mid-week; I usually put them up Friday or Saturday, right before the next game. But this one is loaded with pictures, as I want to give the players time to study the final disposition of the battle before Saturday so they formulate strategy. They're in a tight spot. Here's the situation. 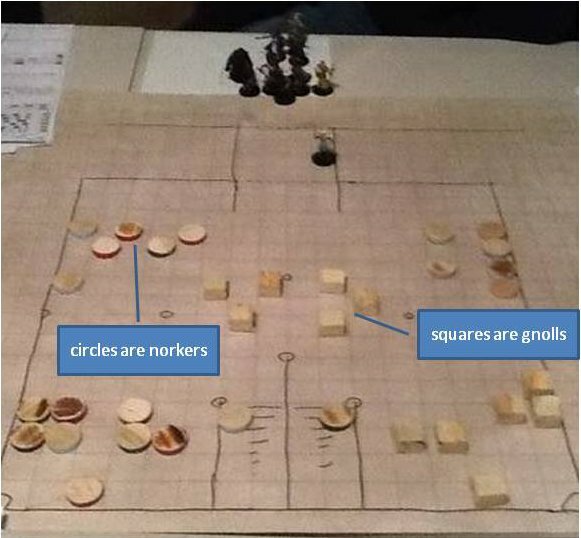 Last game session, the party scouted a location they were calling the Black Temple. It's actually the site of WG4 THE FORGOTTEN TEMPLE OF THARIZDUN. Tharizdun is another storied Gygaxian location in Greyhawk, and the designer notes indicate it was used in Gary's campaign as an adjunct to S4 THE LOST CAVERNS OF TSOJCANTH. Gygax's creations are known for intense tactical combat, and Tharizdun has the potential for a fierce pitched battle right near the entrance. The Black Temple exterior is a step pyramid up on a mountain top, with a large ramp leading into the side of the top tier. A yawning passage leads into the side of the pyaramid. The group sent an invisible thief up ahead to scout, who came back with a fairly detailed description of the interior, and the disposition of the various monster guards. When he returned, they set about to battle planning. This took a lot of time, but it was one of those situations where the planning was the important part of the game. 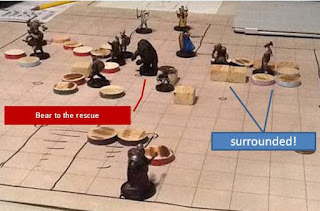 The party used a combination of invisibility effects and silence 15' spells to get their elf fighter magic user surreptitiously into the entranceway to open hostilities, while the rest of the group hung back to wait for his signal. He tossed away the rock carrying the Silence spell, and opened hostilities with a Sleep spell. That picture above is how things looked right before the elf threw the first Sleep spell. Groups of norkers and gnoll archers milled about on guard duty. You can see in this one, the group has thrown some sleep spells and moved in to engage. The pennies indicate sleeping monsters. I've mentioned that the movement rates in AD&D are really high compared to classic D&D, three times as fast, so characters can move super far. One player described it like being able teleport around the map. 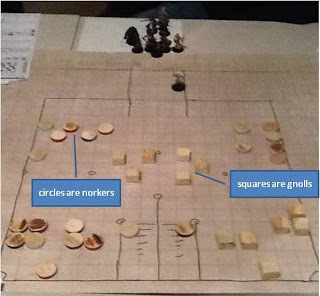 For example, a fighter in classic D&D can move 4 squares on a 5' grid each round; in AD&D the same fighter can move 12 squares. Unarmored guys move 24! That's like walking in from the next town over. So they were able to send the fighters to the flanks and the thieves straight ahead to start knifing sleeping monsters. Unfortunately, things were about to take an ugly turn for the players. 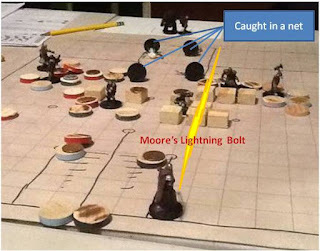 When the players first sent the thief up to search the entry way, two things went wrong: the thief missed a find traps roll, and when he described his search procedure, he completely omitted looking up or checking the ceiling; he missed seeing the large weighted net clinging up there, 30' up in the shadows. There were also some monsters hiding behind the entrance wall, controlling the net, that they missed on that first scouting trip. The norkers hiding behind the entrance walls dropped the net, catching the clerics and magic users underneath a tarry mess, with weights and hooks. Because the characters all ended up near the edges, they had the chance to crawl their way out, but it would still take a few rounds, and they were getting pummeled by monsters with clubs in the meantime. Mister Moore was right in the middle of the net, but his brownie familar, Packer, used Dimension Door to get him to the other side of the hall. Once he was recovered from the jaunt, he lined up a wicked lightining bolt (pictured) and this helped quite a bit. He would later snap off a fireball close by, as monsters swarmed him from the other side of the hall. The fighters are still pinned and surrounded. 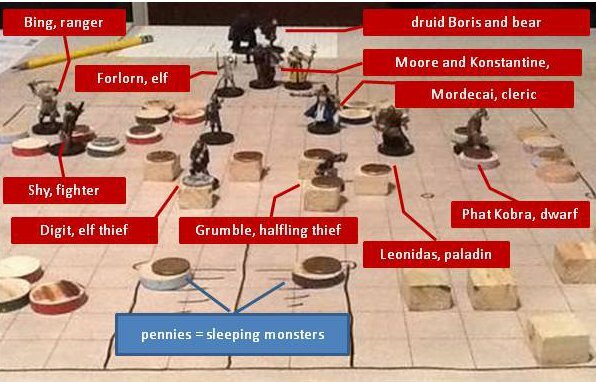 The two thieves, Grumble the Halfling and Digit the Elf Thief (the miniature with a sack over his shoulder) have been taking a beating since they were acting like front line fighters. Both of them now have hit points down to the teens. The clerics and magic users just escaped the netting and haven't had a chance to start engaging. We use a battlemat about half the time, depending on how complicated is the situation. Since this one started with 40-50 monsters and characters, the miniatures and little wooden blocks really help keep it straight. I snapped the pictures to document the battle for the guys that missed, and also so we can set the board again next weekend. We game in an upstairs study that's not usually ransacked by the kiddos, but you can't be too sure with a 5 year old on the loose. I'm curious to hear if other folks have played THE FORGOTTEN TEMPLE OF THARIZDUN, but try to stay away from too many spoilers in the comments, since my players will read the game report to study the tactical situation for next week's game. 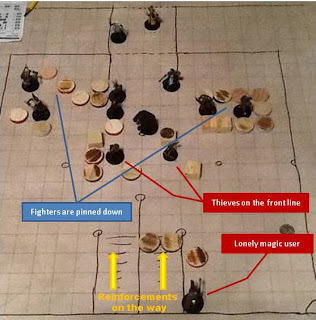 They've got two injured thieves holding down the front line, their 7th level magic user is all alone at the front of the hall, their clerics took a beating getting out of the net, and their three tough fighters are engaged on the flanks - they've got plenty to think about. And is that the sound of reinforcements coming up the stairs? Next week should be interesting. Let me know if the picture-by-picture display is worth it, maybe we'll do it again next week to finish off this battle. Oh! I so need this right now. The Dragonsalyers (my kid's group) are about to head to the Temple now having just completed S4. I am going to need to read this one in detail. Great post! Unfortunately, it looks the players made the biggest mistake - taking the fight into the upper level of the structure. You gotta keep the action outside so you can send as many of those beasts down a cliff as possible! I love the pictures -- I always enjoy reading your reports, and the pictures just made this report even better. Nice report, and the pictures help a lot. I have "look up!" on my player hint sheet tacked onto their side of my GM's screen, and man, it's helped them a few times already. It's easy to forget - how often do we look up when we walk around even in unfamiliar places? Very nice. Always wanted to run Tharizdun, but never got the chance. And, were I a player, I'd think the pictures would be a great help.